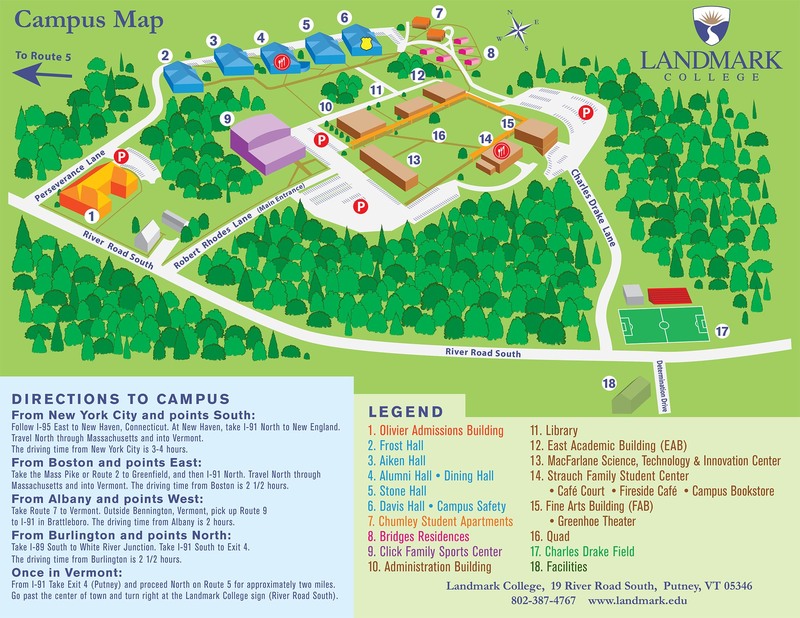 Landmark College is located at 19 River Road South in Putney, Vermont, in the southeastern tip of the state. Follow I-95 East to New Haven, Connecticut. At New Haven, take I-91 North to New England. Travel North through Massachusetts and into Vermont. The driving time from New York City is 3 to 4 hours. Take the Mass Pike or Route 2 to Greenfield, and then I-91 North. Travel North through Massachusetts and into Vermont. The driving time from Boston is 2 1/2 hours. Take Route 7 to Vermont. Outside Bennington, Vermont, pick up Route 9, to I-91 in Brattleboro. The driving time from Albany is 2 hours. Take I-89 South to White River Junction. Take I-91 South to Exit 4. The driving time from Burlington is 2 1/2 hours. From I-91 Take Exit 4 (Putney) and proceed North on Route 5, for approximately two miles. Go past the center of town and turn right at the Landmark College sign (River Road). The most convenient airport, with service by many airlines, is Bradley International Airport near Hartford, Connecticut. Rental cars are available. The driving time from the airport is 1 1/2 hours. The Amtrak train station in Brattleboro, Vermont is a 20-minute drive from campus. The Greyhound bus station in Brattleboro is a 20-minute drive from campus. Shuttles from Bradley International Airport are generally available at 10 a.m. on the morning of New Student Registration. For more information, email shuttle@landmark.edu or see the shuttle webpage. With advance notice, we may also be able to provide pickup from a Brattleboro/Putney hotel or the Brattleboro Amtrak or Greyhound station. Please email shuttle@landmark.edu with your request.